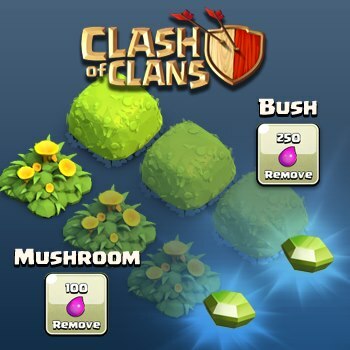 The Gems are premium Resources and also the General elements of the Clash of Clans game. 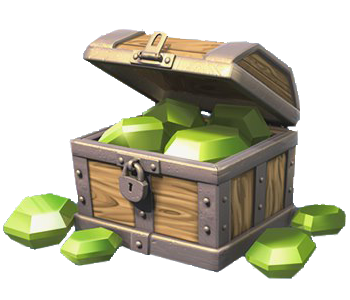 Gems are the premium in-game currency used to advance players’ villages. When players first download the game they begin with 500 (250 of which you are forced to use for Builder’s Hut during the tutorial, and another 8 if you rush the buildings and troops when prompted). 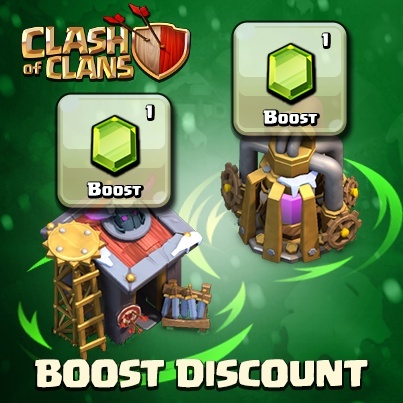 Additional Gems can be earned in-game by completing Achievements or clearing Obstacles, or purchased with real money. There are several items, such as some Decorations (Pirate Flag, Mighty Statue) and additional Builder’s Huts, that can only be purchased with a substantial amount of Gems. 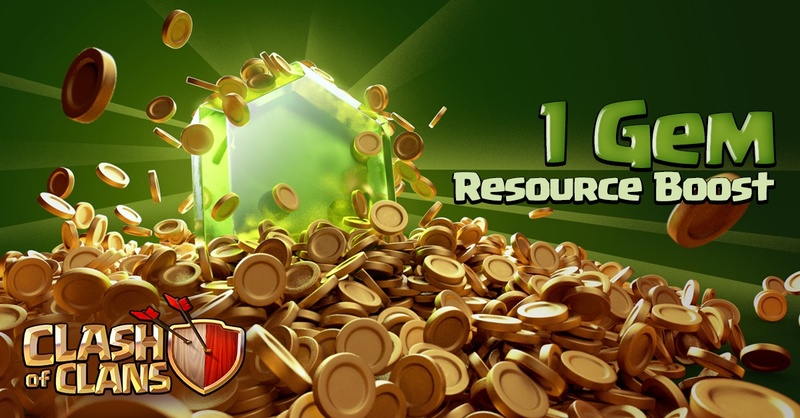 Gems also can be used to buy other Resources such as Gold, Elixir or Dark Elixir in varying amounts. They can be used to instantly finish the Troop training queues in Barracks and/or Dark Barracks. 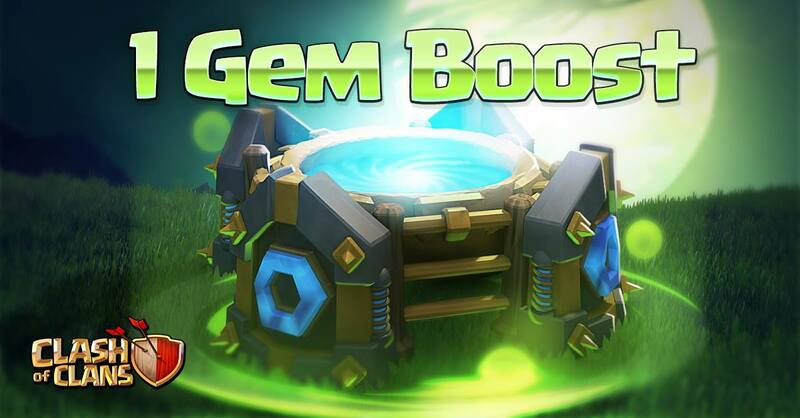 Gems can also be used to instantly complete the construction or upgrade of Buildings, or Troop upgrades in the Laboratory. 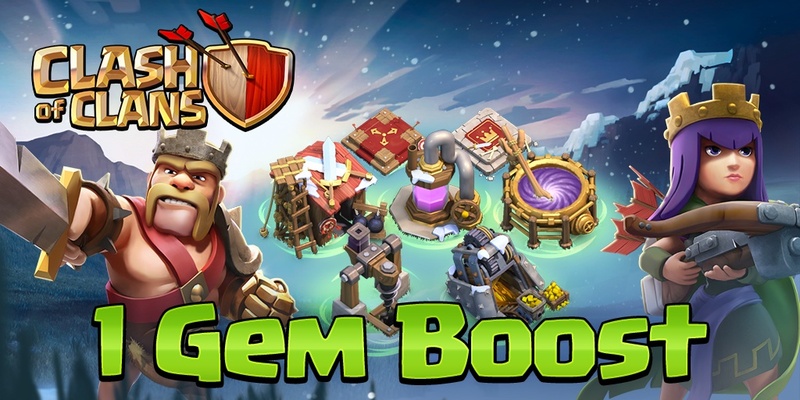 Players can also speed up with Gems the production of Barracks and/or Dark Barracks. 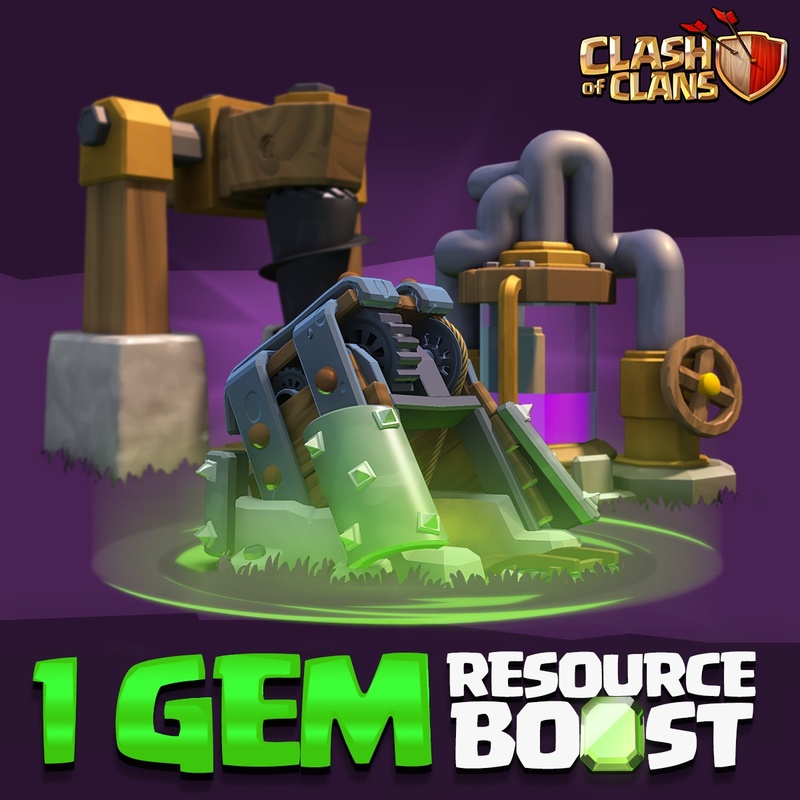 Speed up the production resource collectors such as Gold Mines, Elixir Collectors and Dark Elixir Drills for a period of time. Speed up the Spells brewing in Spell Factory. Heroes can be recovered or their healing rate can be increased by gems. 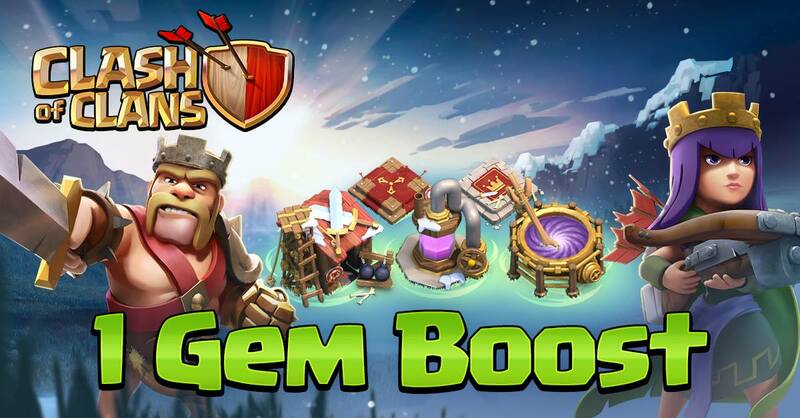 Gems can be used to purchase Shields , which will protect your base from attacks for their duration. 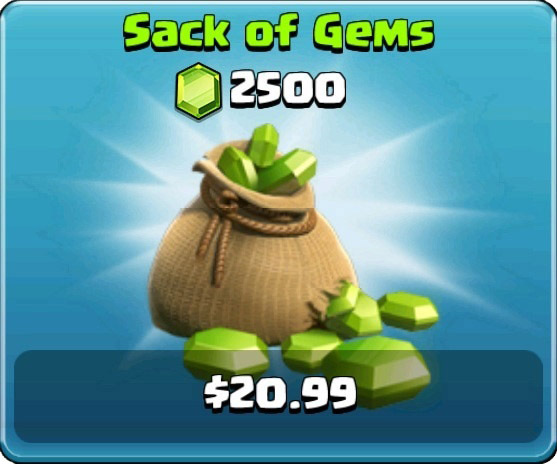 If you using gems correctly, buying them can really speed up your progress in the game by a huge lot! 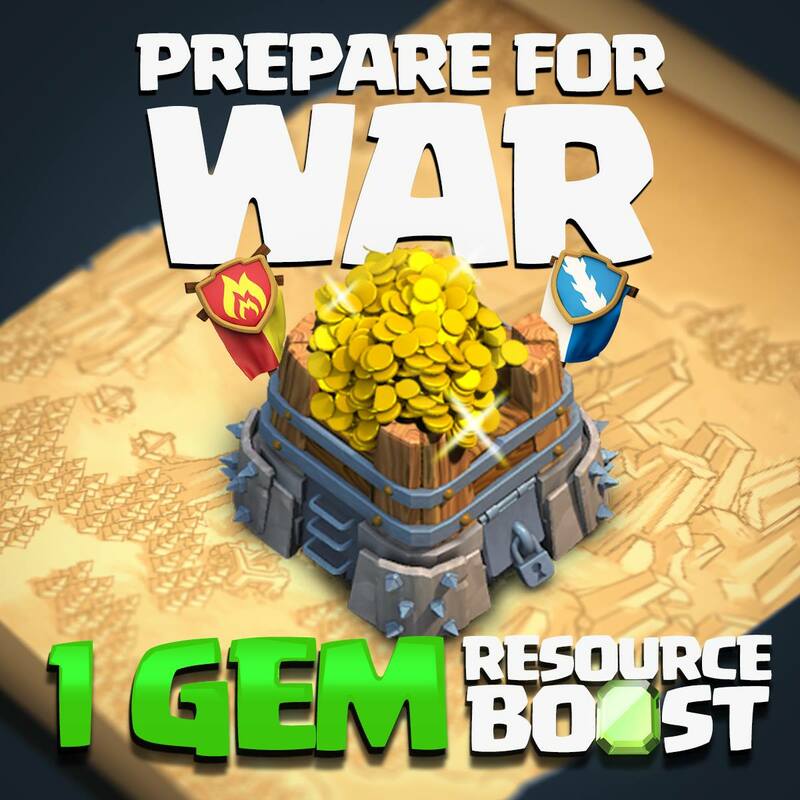 For example, not using the gems for the sole reason to upgrade your Town Hall to level 10, leaving the defenses at an extremely low level, but use gems to speed up troop training, allowing rapid attacks and rapid raiding of Resources. Another way is to (if you are an impatient person), use it to speed up long building upgrades. 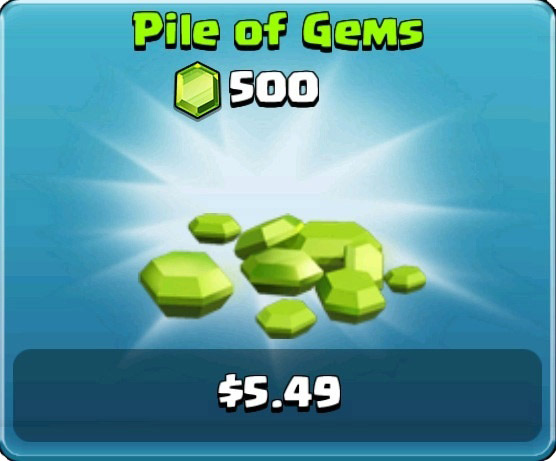 Some people buy Gems for the sole reason of building the third, fourth or fifth Builder’s Huts (quite often the third). However, upon achieving 1,250 the player is awarded 450 , which is by itself nearly enough to buy the third Builder’s Hut. See Achievements for more information about in-game Gem rewards. Gems can be earned in the game without spending real money by completing Achievements. When you complete challenges in the Achievements menu, for example, «Clear 50 obstacles», players are rewarded with Gems. When players gain 3,200 , they will be awarded 2,000 . This is the most amount of gems players can earn from achievements, use them wisely. Another way to earn Gems is to clear Obstacles. This process are a never-ending (albeit slow) source of Gems. Obstacles will give Experience and anywhere between 1-6 whenever they are cleared, although sometimes they may not give any gems at all. 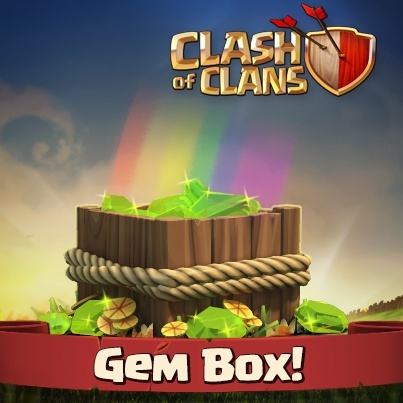 There is also a special obstacle known as a Gem Box, which always yields 25 when cleared, but is much rarer than other normal obstacles, such as trees, and usually spawns about once per week. A further (although limited availability) way to earn Gems in game is to be one in the Top 20 players of the Top 3 Clans. At the end of each two-week period, the Top 3 Clans earn 50 000 for 1st, 30 000 for 2nd and 15 000 for 3rd; these totals are divided equally among the Top 20 players of the respective Clans. 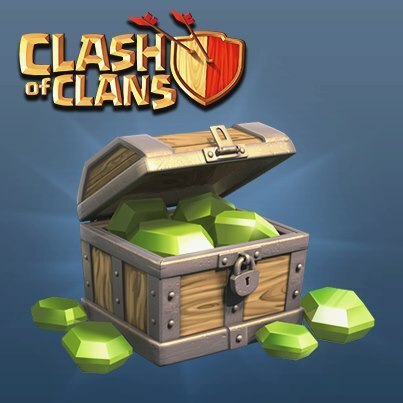 To get Gems not by the game, on the Official Website of the game, periodically conducted various competitions for which the winners receive awards in the form of Gems. 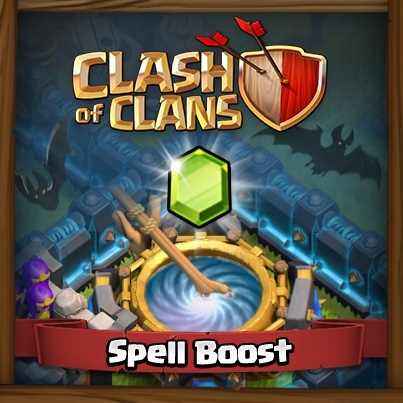 To encourage players to spend more time at the gameplay, the developers also arrange promotions to lower the cost of accelerating the training of Troops, Resource mining or brewing Spells. Typically, such actions are held in anticipation of the holidays (Christmas, Hellouin, etc. ), and the price of acceleration during the action, always reduces to 1 . 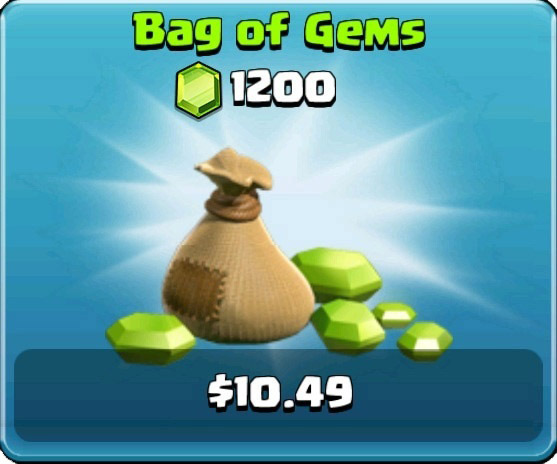 Clash of Clans is free to play, but contains a premium currency (in this case Gems) available for purchase for real money that gives players in-game advantages. These type of games are called «Freemium» games. 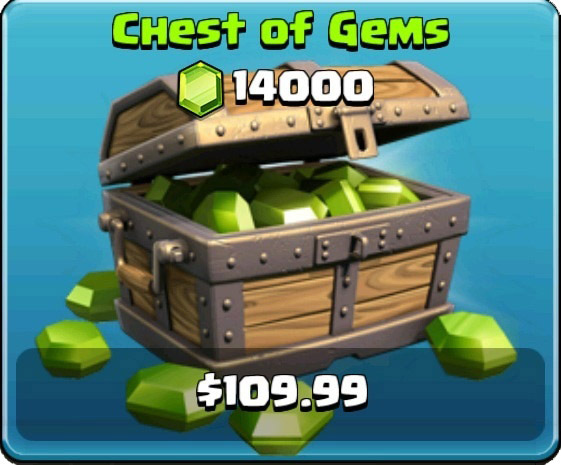 As players buy larger amounts of Gems per purchase, the cost per Gem decreases. 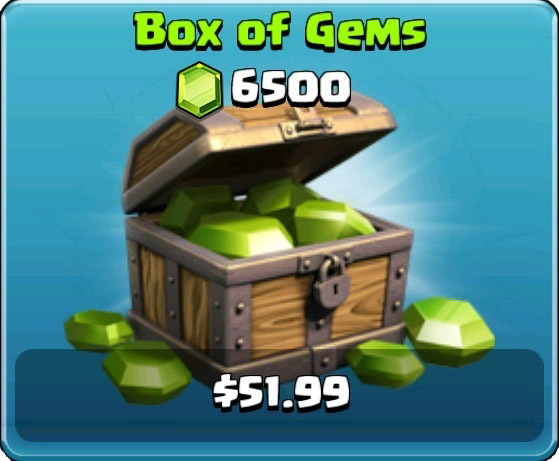 Many (if not most) high-level players buy large quantities of Gems (these players are often called «Gemmers»); Jorge Yao, who was one of the top players in the world, has stated in interviews that he had spent over $2,500 buying Gems. 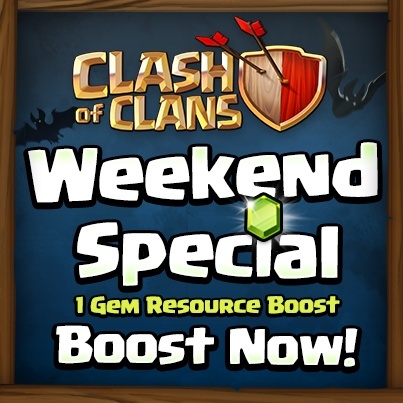 It takes much more gems to heal a Hero or to request Clan Castle troops than to finish upgrades or troop training: for example, it takes 7 to finish an upgrade or troop training with 20 minutes remaining, but it takes 42 to request Clan Castle troops again immediately after requesting and 23 to heal a hero with 20 minutes remaining. 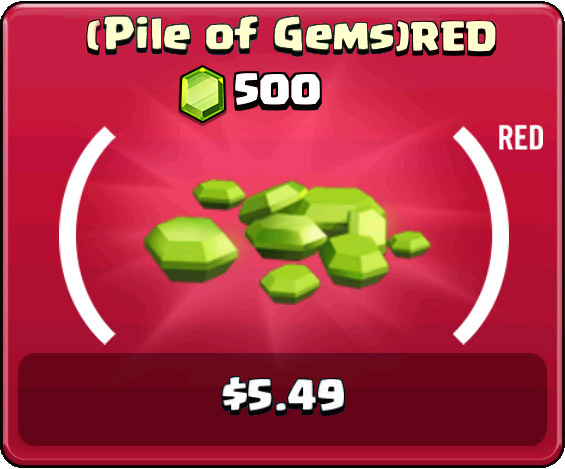 Between November 24 and December 8, 2014, and between November 30 and December 4, 2015, iOS users were able to purchase a (Pile of Gems) RED for $4.99 to contribute to AIDS research. When they did they received a red shield on their Town Hall in 2014 and the red flag with brackets “( )” on their Town Hall in 2015.